Capable of firing up to 372 fps. Comes with the ACU50 draw for a smooth performance. The Venom is priced slightly higher than some other models and might not fit all budgets. If you frequently find yourself trying to maneuver your bow in cramped hunting blinds, you might want to consider the Venom crossbow from TenPoint. While it does come with a higher price than other models, it is worth the added expense when you consider its sturdy build and high performance design. It is a compact crossbow that didn’t sacrifice power or speed making it a great choice for hunters or target shooting in confined areas. One of the most important aspects to consider when you are looking for a crossbow is its build. While you want the crossbow to be lightweight, you also want it to be sturdy and well balanced. Heavy bows can cause arm fatigue and your hands to wobble, which can throw off your aim and ruin an otherwise perfect shot. The same is true is the bow is not balanced, which can also result in dangerous shots. This is not a problem with the compact Venom crossbow, which comes with a sturdy construction. The limbs provide plenty of strength, while the HE cam systems ensures a smooth and powerful draw. The short 19.5 inch carbon barrel won’t add any additional weight to the crossbow, and it provides a smooth path for your arrow to travel. Since the Venom crossbow features a lightweight and compact build, it is also incredibly comfortable for most shooters to use. A crossbow’s design is one of the first things that will catch your eye, and this is true of the Venom. Its compact design looks as powerful as it performs, and you will appreciate the “mossy oak” camouflage print that makes it easy for you to blend into your surroundings. 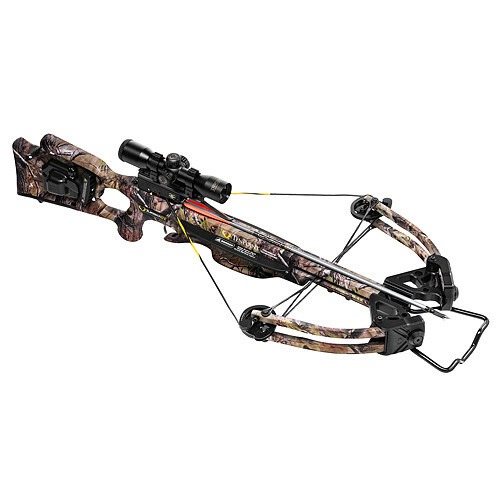 Measuring 17.6 inches from axle to axle and 34.6 inches in length, this crossbow is perfect for kids and adults. You will also appreciate its stylish and professional appearance. Along with designing an attractive crossbow, TenPoint also ensured that it is safe for archers at all skill levels to use. The “bull pup” style stock fits comfortably and securely against your shoulder so you can take careful aim, and the HE cam system helps to reduce painful vibrational shock. The 3.5 pound trigger is easy to pull, but still has plenty of resistance to prevent accidental misfires. Along with the dry fire inhibitor the crossbow is also designed with a safety switch, but hunters should note that it does make an audible click that can startle prey. You will love how smoothly this compact crossbow performs when you are target practicing or out in the field. The HE cams provide a smooth and easy draw, while also producing plenty of energy behind each shot. Instead of wasting the energy produced from the draw or sending painful vibrations, it channels behind the arrow for a more powerful shot. The bow is capable of speeds up to 372 feet per second, which is more than enough to keep up with your prey and with a draw weight of 185 pounds you can easily and humanely take down most types of North American game. 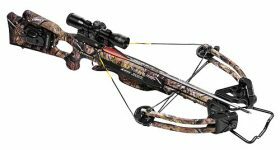 With its higher than average price tag, this crossbow delivers all of the speed and performance you would expect. There are plenty of features included with the Venom crossbow package, so you can immediately start hunting or practicing right out of the box. The bow is incredibly easy to set up, and the sight can be quickly adjusted. While the included scope may not be powerful enough for long range sighting, it is accurate up to 40 yards. The crossbow package also includes the Bowjax dampening kit which will effectively eliminate any noise that might startle your prey. While the dampener will silence any twangs the string might make, the safety will still make an audible click. It also includes a convenient quiver, along with 6 strong carbon tipped arrows. The main feature of this crossbow is the ACU draw 50. The ACU 50 will effectively remove up to 50 percent of the draw weight, for a smooth and easy pull. This also makes it a little easier to hold the draw for a longer period of time, but this also depend on your upper body strength. The Venom is the perfect choice for serious hunters that need a top performing crossbow, and don’t mind paying the extra price. It features a sturdy build and powerful design that will accurately guide your arrows to the target. The shorter stock fits comfortably against most shoulders, and the HE cam system ensures that there is plenty of power behind each shot without painful recoil. With the included safety features this crossbow can be easily used by beginners and experienced archers, and its compact size makes it great for confined spaces. While it is priced higher than many other crossbows, serious bow hunters agree that it is worth the added cost.